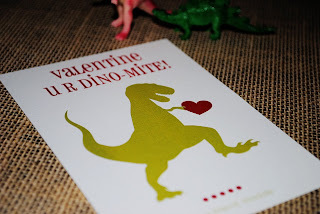 I have another little Valentine's Day printable freebie for you. My kids love dinosaurs and we often have dinosaur books brought home from the library. Actually, my daughter's class just finished up a unit on dinosaurs so she was so excited about this design. To complete her Valentines for her classmates(which had to be brought back to school already) I created a simple little design for the boys in her class. Of course this could have been for the entire class but, we did the hairclips for the girls already. See this post. See the small guys in the photo? We found a package of small toy dinosaurs at Target in the Valentine section. We added a few of those, some small treats and the Valentine card to a cello bag and it was good to go. I have yet another small Valentine printable to share with you later this week. It's part of my son's Valentines for his classmates. So check back for more goodies - YAY! thanks. this saved the day!